Our Bun is served on a bed of fresh lettuce, cucumbers, pickled carrots and daikon, bean sprouts, seasonal herbs and crushed peanuts with sweetened fish sauce. If you are looking for a healthy hearty meal, Bun is it. 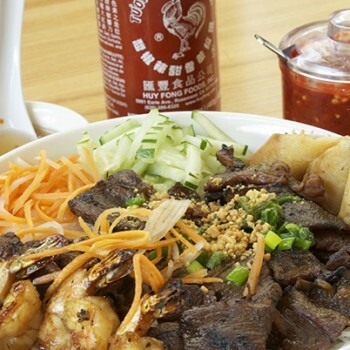 We offer several different styles of Bun including our Hue style spicy noodle soup with beef and pork. You can get it with grilled pork, chicken, or shrimp as well. One of our favorite dishes is the Tom Thit Nurong Cha Gio, a dish with charbroiled marinated shrimp, pork, and an egg roll. Add some chili sauce to your fish sauce and pour it all over and this dish will make your night. We also offer this dish with tofu or vegetables if that is more your style. Come in and try any of our Bun dishes, we are sure you will like it.